Hey, auto repair shop owner! Would you love to find your Turnaround Point for profit, leadership, management, daily operations and car count? 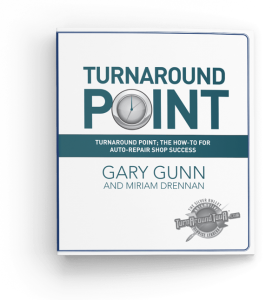 Having worked in the auto repair industry for decades, I have seen a lot of trends come and go. These include business trends, marketing trends, and hiring trends. Some trends we own only a small part of, like economic trends. A business that is financially healthy increases its chances of surviving the twists and turns that the auto repair industry and individuals face from time to time. However, a business that operates solely on every whim and trend might not. This leads me to the other types of trends I’ve seen. There are a lot of non-proven sellers out there trying to get your money. They claim to have the answer to your success, telling you the best way to market your business, and what formulas to use to find the best people. Many of these are knee-jerk reactions, capitalizing on a business owner’s persistent quest to have the latest and greatest information, whether it’s valid or not. Other models and processes are in no way adaptable to the industry you and I have been working in. Still, others promise to teach the how-tos, but they never quite arrive there; they just want more money each step of the way. • Learn to budget for profit. • Advertise and market services. • Develop solid leadership skills. • Manage daily operations systems. I have spent over three decades helping others learn how to accomplish each of these four truths. We have helped thousands succeed in the auto repair shop business using tools and proven methods that are adaptable to any client’s budget, schedule, or preference. These include print resources, live learning events, audio/video libraries, and online learning webinars. 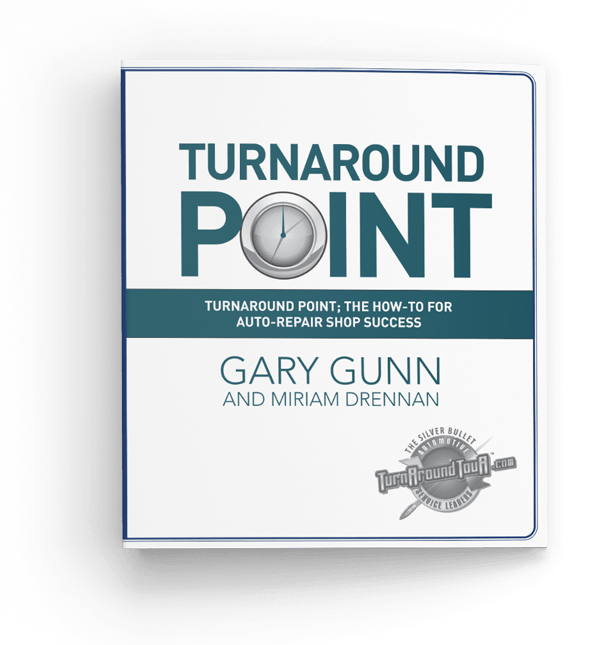 The “Turnaround Point” book is a culmination of those years of experience. Friend, I teach the how-to. You must furnish the energy for the never-ending quest for success. Your ‘want-to’ must always be part of your internal core. I have been privileged and blessed with knowledgeable contacts throughout my automotive learning journey. I want to thank them for allowing me to learn and utilize what they know works. What you read and learn from this book is a collection and gathering of concepts that have brought me to where I am today. I want to thank the following people who have helped shaped my knowledge: Greg Sands, Tim Ross, Michael Gerber, Richard Flint, Todd Hayes, and the many shop owners I have had the honor to learn from. I would also like to thank Miriam Drennan (“That Writer”) who has taken my voice and created this written version you are about to read or listen to. She has captured the essence of what we do and I am so glad I was referred to her by Seth Spears. Without Miriam this book would not have happened. I will always be in awe of her capacity to capture my voice in print. If you are listening on an audio version, Christi Bowen is the beautiful voice you are listening to. Thanks Miriam for the referral. Ellen Parker Bibb has added her artistic touch and design to make this book shine. Thank you Ellen, for a job well done. My Lord and Savior provided many people along my journey I am eternally grateful. Thanks to Him, this is all possible.